Known as “the longest day of the year,” the summer solstice marks the official beginning of summer in the Northern Hemisphere. It is the day in which the sun reaches the highest point in the sky. Around the world and throughout history, there are celebrations, feasts, festivals, and rituals for the summer solstice. It is believed that Stonehenge’s mysteries lie in the solstices, while many different religions worldwide celebrate feasts on this date. In Italy, the summer solstice is an important time, with many legends and traditions. The word “solstice” itself can be found in ancient Italian culture, from the Latin solsitium, meaning “the sun stands still.” During the summer solstice, there is an illusion that the sun does stand still, as it reaches its highest point in the sky, with the Earth tilted as far as it goes toward the sun. In Italian culture, a legend states that the summer solstice is “a door that opens and connects two worlds – the real and the supernatural.” Historically, this door opens on the brightest day of the year, between June 20 and June 21, on the summer solstice. 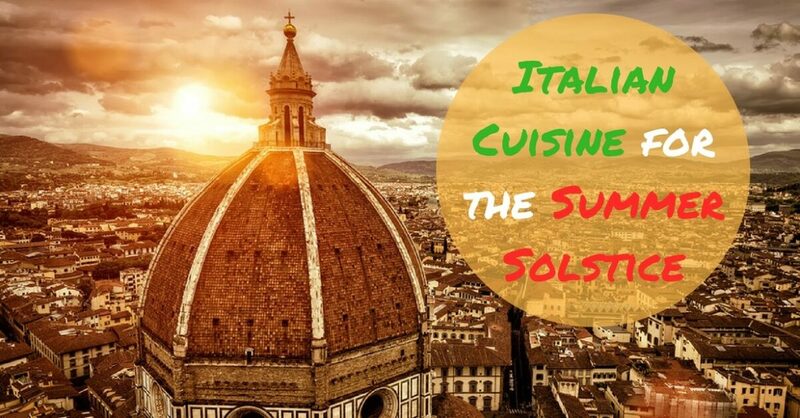 The summer solstice has played an important role in Italian culture. In religious ceremonies, the summer solstice is celebrated in cathedrals across Italy, from Florence to Siena. In fact, the architecture of these grand buildings has been designed to observe the passage of the sun in the sky. In Florence, a special phenomenon happens when “the sun’s rays fall through Brunelleschi’s dome, forming an image of the solar disk that will overlap perfectly with that of marble placed on the floor of the Chapel of Cross, on the left of the High Altar.” Similarly, in Siena, the Cathedral is open from 7:30pm to 12:00 am (midnight) for visitors to wander through the library and crypts and view the unfinished Facciatone (façade) of the Cathedral. In Puglia, there is a long-standing summer solstice legend. It is said that on the night of the summer solstice, long ago, “the sun married the moon and from this union…beneficial energies are poured on earth, especially on the grass wet from dew, which turns into a powerful medicine that cures all types of skin diseases.” From this legend comes the popular usage of the plant, St. John’s wort, which is grown in the wild and has been used historically to treat a wide range of illnesses. The summer solstice in Italy has also been linked to St. John the Baptist, whose feast occurs on June 24. On St. John’s Night, it was customary to prepare nocino, a liquor made from unripe walnuts, left on the grass to soak up the special light of the summer solstice. In ancient times, villages all over Italy gathered around huge bonfires on June 24, often near walnut trees. What’s a celebration in Italy without food? The summer months bring a bountiful harvest in Italy. In season during June, July, and August are produce such as cucumbers, eggplant, melon, peppers, zucchini, zucchini flowers, basil, tomatoes, peas, peaches, watermelon, berries, plums, and figs. Strawberries and blueberries are a favorite in June and July, as well as lemon. With so many fresh fruits, Italian cuisine loves to pair a dry-cured meat with something sweet, such as prosciutto and melon. Year-round favorites such as eggplant and tomato are especially fresh and flavorful during the summer months. Bruschetta and caprese both showcase the simple delight of a fresh summer tomato, while eggplant and basil can be found tossed with pasta. Come join us for a meal on the summer solstice, or swing by any time this summer to experience the freshest Italian cuisine in Salt Lake City. On our menu, you’ll find flavor combinations that capture the best of Italian summer cuisine, perfect for the climbing temperatures. Start with our burrata and roasted tomato appetizer, or perhaps caprese e prosciutto, with fresh sliced tomatoes and mozzarella, basil, and prosciutto. Our eggplant parmigiana is topped with tomato sauce, fresh mozzarella, and basil. For a combination of savory and sweet, try our anatra in porchetta, a rosemary and fennel crusted duck breast, served with roasted figs. We look forward to sharing a meal with you on the longest day of the year!